Also known as "Tiger Eye" and "Tigers Eye"
Brown tiger's-eye cabochon: Brown banded tiger's-eye cut into an oval cabochon. Image copyright Geology.com. Tiger's-eye, also called "tiger eye" and "tigers eye," is a very popular gemstone that displays a chatoyancy (cat's-eye) when a polished stone is moved back and forth in incident light. It is a quartz gemstone, usually amber to brown in color, that forms when fibers of the mineral crocidolite are replaced by silica. This structure of parallel fibers is preserved in the stone, and the chatoyant "eye" crosses the parallel fibers at right angles. The best specimens of tiger's-eye are usually cut en cabochon in an orientation that yields the best display of chatoyancy. 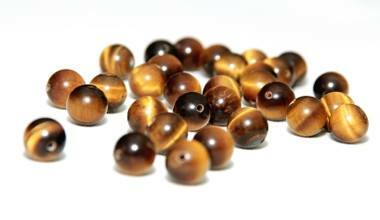 Tiger's-Eye Beads: Brown tiger's-eye beads. Image copyright iStockphoto / Sohfian Mohamed Kamari. An internet search will show that not everyone agrees on how to spell the name of this gemstone. Many people are unclear if it should be "tiger" or "tigers" or "tiger's" in addition to whether or not a hyphen is used. For this article, we have come to the conclusion that "tiger's-eye" is the most proper way for the name to be written. That is how it is written in Gemstones of the World by Walter Schumann, which is an authoritative book with the distinction of having more copies in print than any other book about gems. The stone also appears as "tiger's-eye" in GIA course materials. Of course, other variations are not necessarily incorrect; however, we believe that since "tiger's-eye" seems to be preferred by some gemologists, scholars, and punctilious editors, then that is also how it should appear on Geology.com. Tiger's-Eye Gemstone: Tumbled tiger's-eye with the typical brown color. Image copyright iStockphoto / Arpad Benedek. 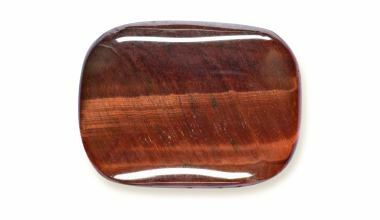 Red Tiger's-Eye Gemstone: Tumbled tiger's-eye with a red color. The red color was probably produced with heat treatment. Image copyright iStockphoto / Arpad Benedek. 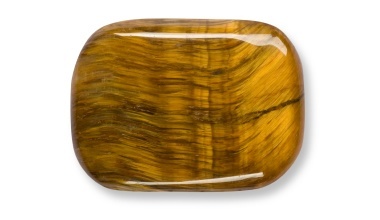 Tiger's-eye cabochons are very popular ring stones. They are one of the most common stones used in men's rings and cufflinks. It is also frequently cut into beads for use in necklaces and earrings. 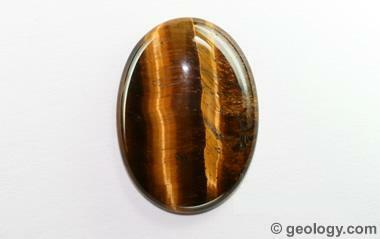 Tiger's-eye cabochons are used in pins, earrings, pendants, and many other jewelry items. Stones with a light honey color are especially popular. Tiger's-eye is frequently used for small sculptures and for producing tumbled stones. It is considered a semiprecious stone. 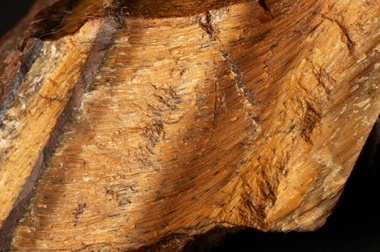 Tiger's-Eye Rough: A piece of rough tiger's-eye. Image copyright iStockphoto / Robert Ellis. Tiger's-eye is frequently used as a rough in the production of tumbled stones. It has a hardness of 7 and tumbles well with other quartz gemstones and with agates or jaspers. It easily takes a high polish in a rock tumbler and is suitable for beginning to experienced tumblers. Most tiger's-eye used as a gemstone is brown in color. A similar material with a gray-blue color is known as "hawk's-eye." Red, blue, and green tiger's-eye are often sold as finished stones. These colored stones are usually treated with heat or dye.